As a native Angelena, I have seen the great challenges – and potential – inherent in this region I call home. Many years ago, I was inspired by my parents’ example of community activism and have since dedicated my career to service and championing equal rights. As a donor and former board member at the California Community Foundation (CCF), I share the foundation’s vision that we are stronger when all Los Angeles County residents are provided with opportunities to thrive. When our neighbors can live with stability and can provide a better life for their children and grandchildren, everyone benefits. For the last 100 years, CCF has been working to impact positive change in Los Angeles. CCF leverages incredible generosity by partnering with nonprofit organizations across the county who serve people that are struggling. From Pomona to Palmdale, from Long Beach to the Palisades, CCF is committed to improving the quality of life for all Angelenos. Thanks to CCF and its decades of donors, more youth across the county are getting vital early childhood education that we know puts them on a path to success; more immigrants are being integrated into the economic and civic fabric of our region; and more formerly homeless families are living with stability and dignity thanks to permanent supportive housing. I am particularly excited about We Are Los Angeles, a public art exhibit hosted by CCF November 12-17 at Grand Park. Serving as the culmination of the foundation’s centennial year, it is meant to lift up voices in Los Angeles County through the universal language of art. 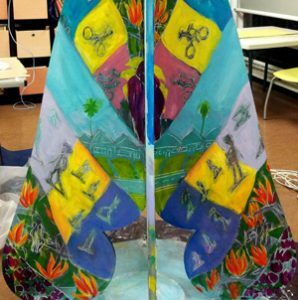 Not only will We Are Los Angeles impart civic pride and unity—values that frame CCF’s work— but the 31 angel sculptures by renowned local artists will highlight powerful areas of need, challenge and opportunity. The artwork themes range from mental health awareness to environmental sustainability to ending sexual violence against women, each bringing to life a dream for a stronger Los Angeles County. CCF’s centennial campaign that launched in fall 2015 has served to help Angelenos envision their hopes for a better region, and provide them with pathways to turn those visions into action—whether by donating time through volunteerism or money to important causes in the region. I hope this culminating event will spark conversation about ways you and your family want to see change in Los Angeles and how you can actively help to enact that change. I encourage you to seek out and partner with organizations like CCF so we can build a better Los Angeles for all residents, together. Cathy Unger is chair of the California Community Foundation’s Centennial Campaign and a former CCF Board Member. She has worked as a public affairs consultant in political, corporate and nonprofit arenas for more than 40 years and currently serves as chair of the Board of Directors of Planned Parenthood Los Angeles, vice president of the American Jewish Committee and on the Board of Directors of the Goldman School of Public Policy at the University of California, Berkeley.